Description In this podcast, Daniela and Katie discuss Urban Legends and Mysteries from all over the world, while sampling foods from the regions they cover. Description: Oh hey there neighbor! Today your favorites hosts are heading North to cool down in Canada, eh! We are swimming in gravy today as we talk lots and lots of poutine! Daniela pretty much one-upped Katie this week as far as her food went. Daniela's story today is that of Falcon Lake and some strange occurrences. Could it be aliens? Could it be a U.S. Military secret project? Listen and decide. Before our second story, we have a promo from Don't Go In There, check them out! Katie closes up with the creepy Algonquin legend of the Wendigo. Description: Greetings Earthlings! Today your favorite hosts are frying eggs on the sidewalk in Arizona! We talk carne seca, we talk fry bread, we even talk cheese crisps. Daniela tells the terrifying story of Stardust Ranch and the man who got more than he bargained for with his Real Estate investment. Then, Katie doesn't help lighten the mood by sharing the story of Slaughterhouse Canyon outside of Kingsman, AZ. Shout out this week to Arizona podcasters Cody and Chris over at BSPodPhx, AKA Believer Skeptic Podcast! Description: Greetings from the Centennial State! Today we talk about colorful Colorado! Katie sent Daniela some snackies to try from Colorado, including almond toffee that haunts John Mayer's dreams. Daniela talks about the many conspiracy theories surrounding the construction of Denver International Airport, (we think Lizard People.) Katie takes it home and tells ghost stories from her former coworkers, prepare to be spooked! Description: Today we bring you a bonus episode that includes some fun urban legends that are known universally, and even have a listener's story for you! You're probably thinking, is this real, or just a hoax? It's Real, I Swear. Description: Willkommen! In this episode we are obviously in Germany! Boy, do we really dive into German food in this one. After stuffing our faces with various meats, krauts, and dumplings, we get down to business. Daniela tells the terrifying tale of the Werewolf of Morbach, including a personal account from a 1988 eyewitness! Katie, however, is talking about Belsnickel, one of Santa's many cohorts in German folklore! Stay tuned for a promo from some fellow podcasters and their movie-themed podcast, One Star Bazaar! Description: Our bellies are full and we are happy about it because this week we discuss the Philippines!! Daniela talks about this kickass Houston Filipino restaurant this week, and has a treat in store. She is telling the tale of the Duende, which includes many personal accounts including one from someone she knows personally! Katie then wraps up with the short tale of the Sirena and the Siyokoy, some of the mercreatures of Filipino folklore. Shout out to CreakyFloorboards today, be sure to check out their podcast when you're done binging ours! Description: Top o' the mornin' to ya, listeners! Though, for some of you, you're not listening in the morning. This week, in honor of St. Patrick's Day we take our hunt for urban legends and hunger for snacks to Ireland! This episode has everything! Vampires, ghosts who can't travel through rocks, and even a nudist poltergeist with a bad attitude! This week's podcast shoutout goes to our friends at CritterCast! Description: It's Mardi Gras, and to celebrate we are taking our podcast to New Orleans! Though we wish we could eat the food from New Orleans all day, we have some urban legends to discuss! Daniela gets giddy over the cousin of her favorite Skunk Ape living on the Bayou, the Honey Island Swamp Monster! If that's not enough swamp talk for you, Katie then tells the tale of Le Feu Follet, the evil Cajun fairies! Grab a beignet or RSVP for a Crawfish Boil with It's Real, I Swear! Description: Mixing it up a bit this week! First, a promo for the amazing Cryptidzoid podcast, be sure to check it out after listening to this! Today, your hosts are taking you on a journey to South Africa. Daniela tells the story of the Flying Dutchman, and yes, there is a bit of Spongebob talk. 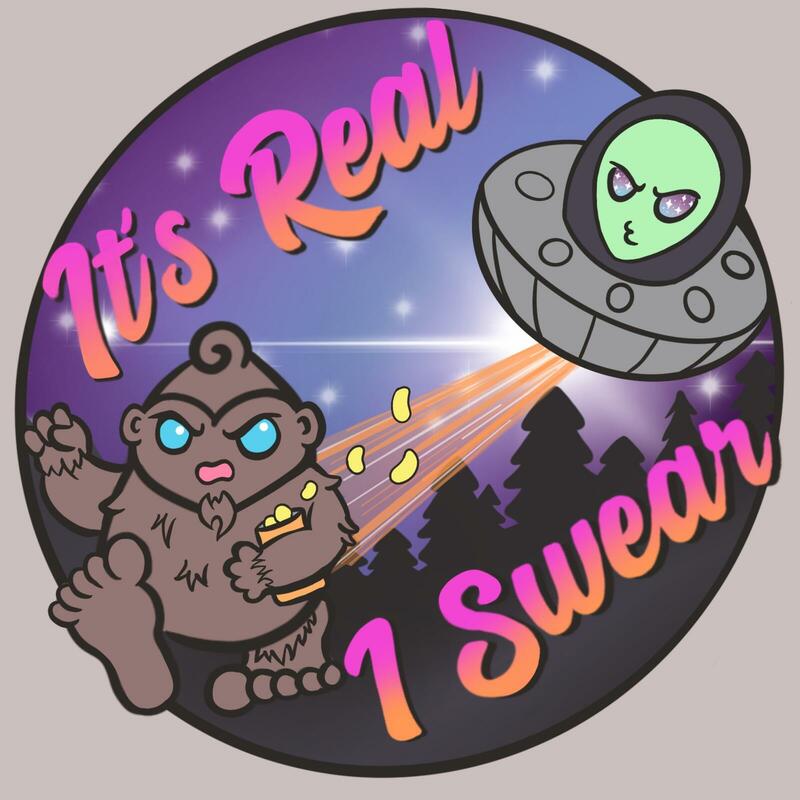 Katie is recovering from laryngitis, but she powers through to deliver some personal accounts of alien encounters in South Africa (of which there are weirdly an abundance of.) So grab some Biltong and sit back! Description: Making our way to the coast, to (in Katie's opinion) the most beautiful state, OREGON! We discuss all of the snacks Oregon has to offer from Tillamook cheese, to hazelnuts, to good old Voodoo Doughnuts. Daniela talks about the legend of Polybius and the Government conspiracies behind this short-lived game. Katie tells the story of the Bandage Man of Cannon Beach and a hysterical personal account of an encounter with this cryptid. Enjoy! Description: Bonjour, mes amis and Happy Valentine's Day. In celecration of love, Daniela and Katie are headed to France to discuss their urban legends. Daniela reveals what really happened to dragons according to French legend, as well as fun jokes the French like to play on American tourists. Katie then discusses the story behind the character on the Starbucks logo, and does so whilst stuffing her face with copious amounts of cheese. Description: OH, HI! Today we travel to Ohio, and BOY do they have good legends. In this episode, Daniela covers the legend of the Dogman, which is Ohio's version of a werewolf. Katie wraps up the episode with the Ohio Melonheads. Intrigued? Give this episode a listen! Description: Yes! You've made it to the third episode! Today we get some sunshine in Florida. Daniela is enjoying a gluten-free Cuban sandwich while Katie fails the snack assignment. We discuss the famous Skunk Apes and the infamous Robert the Doll, who is a very lovely doll that we are so thankful for, by the way.... enjoy! Description: Welcome back! In this episode we are munching on strawberries while discussing the urban legends of Oklahoma! Daniela talks about Beaver Dunes Park and the Shaman's Portal, and Katie wraps it up while discussing the Seminole legend of the Stikini. Description: Welcome to the first episode of It's Real, I Swear! In this episode we talk about Eskimo Ice Cream, eat salmon two ways, and discuss the bizarre happenings and disappearances in the gorgeous state of Alaska.